extend our connection to the larger community that we serve. We wanted to push ourselves (and the readers) out of a comfort zone within this publication and tackle issues that questioned this relationship with the built environment, and within our collective group. 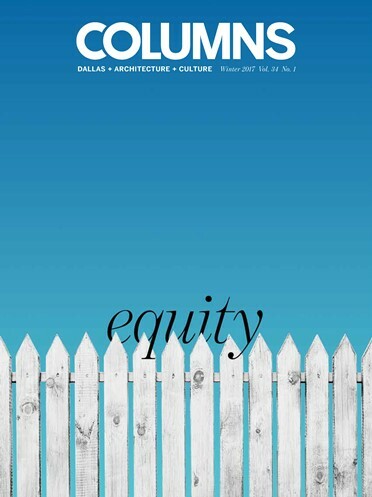 This issue on equity in architecture begins a wide-ranging conversation that will be explored in three forthcoming issues. We will dive into the architect’s relationship with concepts such as ego, morality, and fashion. We will navigate through topics that are at times uncomfortable, but most importantly topics that are critical to our community’s pressing challenges. It will take the combined wisdom of a number of people with differing viewpoints from within our profession and community as a whole to acknowledge the challenges and work together to create solutions. Today, our sense of community feels more important than ever and we must work together to be catalysts for noticeable change. As you read the following commentaries on equity, diversity, and inclusion, remember that our profession is currently 81% male and overwhelmingly white. Be thinking about how we as a community of architects will continue to welcome individuals of all backgrounds and persuasions, regardless of religion, ethnicity, gender, age, race, appearance, or orientation. Let’s work together to identify and eliminate barriers and celebrate individual differences, creating a profession and culture where differences are valued. We have the ability to lead this effort and make impactful change. However, our collective voice is necessary to ensure that no one person ever feels marginalized. Where do we go from here? Let’s acknowledge the issues, assert our voices, forget complacency, and be catalysts for change. Most importantly, let’s do it together.